Graffiti artist in the 90's, and freshly armed with an honours degree in communication arts Ant decided to set up a legitimate commercial art business after running out of walls to paint. Quickly gaining a reputation for creating striking artwork with impact A.k.A was born. From there A.k.A has grown but still very much stays true to it's origins, staying humble and keeping our core values by retaining a focus on communication, creating images that speak to their audiences in an artful way. We have grown into a studio that has the ability to create a wide array of imagery. Starting off in little more than what was originally a cupboard we now work from our central London based creative art and design studio making imagery for brands, big and small, from around the world or around the block. Let's just say, we don't do statistics and numbers. What we do do is create striking and completely bespoke art, design, illustrations and animation for companies spanning the planet. In the nearly twenty years that we have been going we have created work for advertising brands, publishers, record labels and production companies, with a proven track record for delivering results time and again. We are, above all, visual problem solvers, photographers, fine artists, 3D modellers, animators, vector artists and pixel pushers. We still love nothing more than to play and experement creatively but take our results very seriously. Ultimately we regard the final results as king, regardless of the method of creation. Ultimately we are completely defined by our work, our work makes our identity, it's who we are. creativity to each piece. We love the work they did for us and can't wait to work with them again!! Be it bespoke illustration, motion graphics, branding, visual identities, design, packaging artwork, original photography or a brand refresh we are lucky enough to have nearly every creative tool at our disposal be it airbrushing, paint, pencils, scissors, scalpals, spray cans, cameras, 3D CGI software, photo manipulation software, fluid simulation software or anything else you can think of A.k.A utilise traditional craftsmanship and crafts and combine these aspects with cutting edge tools to create imagery that is truly original and taylor made to every client's specific brief. Our work doesn't stop at technique though, we also use almost twenty years of experience ensuring we solve visual problems and are passionate about ensuing we solve these problems in the best ways possible. We DO judge a book by its cover, and truly LOVE the process. Ultimately our attention to detail is second to none and we are highly motivated to create interesting and engaging imagery for a broad range of clients. We will never grab ideas 'off the peg' to fit it to a solution but instead always ensure that our approach is 100% bespoke every time, tailor made to each and every client and brief specifically for the job in hand. In a way it's comparable to buying an original, tailor made suit, it's always made to fit you perfectly. Our use of crafts is brought into sharp focus with this example where we utilised a massive array of techniques to execute this particular image. 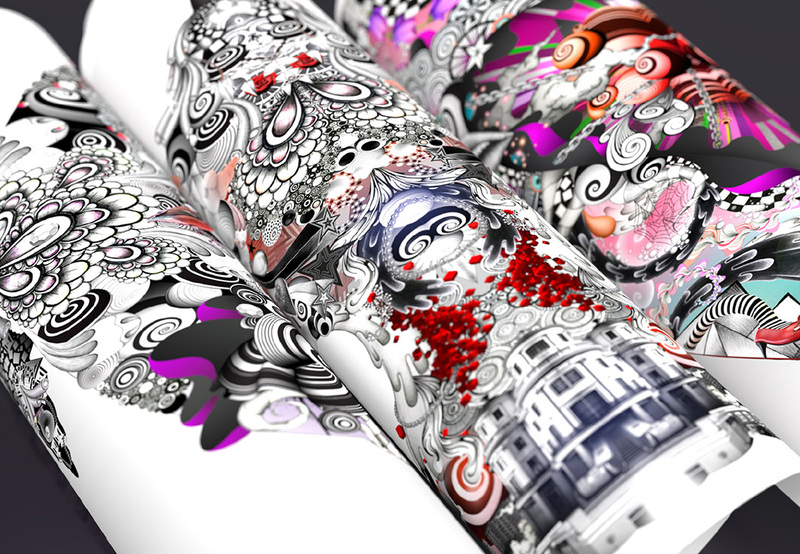 Some of the methods employed for this series involved creating particle systems which were rendered in a 3D modeller, in depth 3D modelling, bespoke photography, pencil renderings, some of which were A3 in size and large pen & ink drawings which were collectively then collaged together to create these series of images. For us it's not just about the finished piece it's also about the love and care that is put into executing each and every brief we undertake. Read more. A.k.A's talent impressed our high-end luxury clients that dominate the consumer market in its category. The work created is a work of art that we're all proud to have been a part of. Very easy to work with and attentive to every detail. I'm very happy to have worked with with this studio. At A.k.A we are fortunate enough to be able to utilise a very wide array of tools, techniques and approaches to ensure we can always create the best results for each client. Nothing is off limits to us when it comes to solving a brief and although we have decades of experience we still approach each and every brief with the same excitment and enthusiasm as we ever have. After discussions with our client and receiving our brief we will often start with extensive sketching, establishing key messages and conceptualising ideas, colourisation and palettes. This is then presented to our client and following their feedback we will carry ideas forward and sharpen the focus, ensuring all of the client's needs are always achieved along the road to completion but also making sure we guide them along the process as it unfolds. To create our polished artwork it often involves the overlapping of many different skills, be they photography, CGI, collage, traditional artworking skills such as pen & ink, pencil renderings, airbrushing or even animations. Ultimately we use any means necessary to create our finished work and we don't see it as finished until our clients are delighted with the results! In our business, results count. Our extensive client list of blue chip companies from around the globe are testament to this.